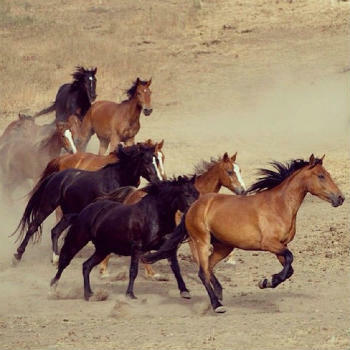 VERNAL, Utah–The Bureau of Land Management (BLM) will host its annual statewide public hearing at the BLM Vernal Field Office to discuss the use of helicopters and motorized vehicles in the management of wild horses and burros on Utah’s public lands. Utah’s current statewide wild horse and burro population numbers currently exceed 4,800 animals, which is more than 200 percent of the approved appropriate management level of 2,000. Having an overabundance of wild horses and burros above BLM management levels may cause resource damage resulting in limited forage and water availability, which reduces the number of animals that the land can support. To date, the BLM has removed more than 15,600 wild horses and burros from Utah’s rangelands since legislated removals began in 1976. Over 8,100 of those animals have been adopted or sold locally; the remainder were shipped outside of Utah for adoption or holding in off-range pastures. Utah’s 2019 satellite adoptions start in March and continue monthly throughout the state. Adoption locations are tentatively set for Farmington, Salt Lake City, Heber City, and Delta, Utah. Animals are available for adoption on a weekly basis at the Delta Wild Horse and Burro Facility. For additional information about the upcoming statewide public hearing, or future wild horse and burro adoptions, visit www.blm.gov or contact the Utah Wild Horse and Burro Hotline at (801) 539-4050 or Gus Warr at the BLM Utah State Office at (801) 539-4057.